If Osteria is still around in a year, I look forward to a repeat visit. For now though, decently yummy food with poor organizational structure isn’t going to cut it. They need to find their footing, or they will be in trouble. An off-putting location, Osteria is relatively small, with a stark atmosphere, blank walls and polished concrete floors, so it’s a little loud. Wonderful aromatics and an ample wine selection make a good second impression. Though we received visits from several different servers, I was impressed with the meticulous delivery of the evening’s specials, from memory. The mentioning of several items being removed from the menu, however, is a bad sign. And the fact that 3 months after opening, the webpage still says “website coming soon,” is also not good. Questionably homemade rolls are presented with a White Bean Bruschetta. I’m pretty sure the gel that you find in the can of White Beans was the base for this Bruschetta; they just threw in Onions, Tomatoes and Basil. The Panzanella Salad differs slightly from the traditional preparation, and features Capers, Kalamata Olives, Tomatoes, Red Onions and killer grilled Polenta Croutons atop Mixed Greens. The salad is totally large enough to share, but I wouldn’t, so that you can enjoy all of those yummy croutons yourself. As far as entrees go, we waited about 40 minutes. Famished, we were tempted to dive right in, until we saw the cloud of steam hovering over each dish. Strozzapetti noodles are short, a little thinner than penne, and are lathered with a creamy meat sauce. 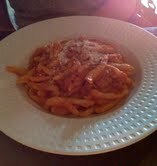 The sauce was yummy, though the pasta was just too al dente for me. A sprinkling of fresh parmesan added an appreciated and needed salty bite. The half portion is way more than one serving. Sheets of homemade pasta are stuffed with Prosciutto and Mozzarella, then rolled up and topped with a Béchamel Sauce before it’s baked au gratin. It gets a topping of fresh parmesan before it’s presented, again, insanely hot. 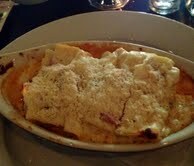 I found it similar to lasagna, with Prosciutto and white sauce in place of Ground Beef and Tomato sauce. This dish is very indulgent. A hint of nutmeg is noticeable in the Béchamel (typical), but I just couldn’t help but imagine how quickly it was sticking to my thighs. I hope they work out the kitchen and staff kinks, because the food has potential. I just don’t like waiting 40 minutes for food that isn’t exceptional, or made by my sweetie.